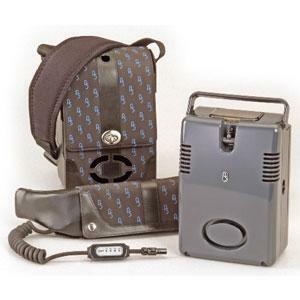 World’s smallest, quietest portable oxygen concentrators for travel. Airsep Freestyle "World's Smallest" Portable Concentrator with BackPack weighs less than 5 lbs. (2.3 kg), Our POV by Airsep is the only truly wearable portable oxygen concentrator on the market. It is tailored specifically for those patients on the go. Airsep Freestyle "World's Smallest" Portable Concentrator captures the heart of what it means to live the good life without limitation. As the most lightweight and quietest portable oxygen concentrator available anywhere, GoSouthernMD offers the same weight advantage of the smallest contents-based systems, yet provides an unlimited supply of oxygen for an enjoyable travel experience with O2. It's oxygen freedom! The built-in battery provides the longest duration between recharges of any portable oxygen concentrator, while its optional AirBelt provides inconspicuous additional battery run time for outdoor and all-day events. GoSouthernMD and the AirBelt combine fashion and function ergonomically, making it the supreme travel oxygen concentrator. GoSouthernMD users travel freely between power sources and no longer need to worry about running out of oxygen.